Ever since palaeontologists admitted that the major feature of fossils is their stasis2 (unchanged condition wherever in the evolutionary column they occur), the main feature in the evolutionary debate is no longer the “common ancestor” (the “missing link” is still missing) but the evolutionary process. Formation of races an observable and reproducible process is referred to as microevolution, and used, or rather abused, as an example of a small step in evolution. It is interesting that when discussing evolution in school textbooks the main arguments used no longer come from palaeontology but from population genetics. They centre on race formation. Of course race formation is a process that is well known, much studied and confirmed in many groups of organisms. It is also confirmed by breeding work where artificial races of many plants and animals are regularly produced for the various needs of man. All this knowledge about races is claimed to support the theory of evolution. I question this conclusion and wish to explain why. Another frequent postulate presented in school textbooks is the claim that new genetic information is created by mutations, and that occasionally positive mutations occur which can be considered as stepping stones in the evolutionary process. Lacking better examples it is claimed that development of resistance to man-made chemicals indicates positive mutations useful in the evolutionary process. I question this claim also, and wish to demonstrate in this paper that such adaptations to artificial chemicals are nothing more than defence mechanisms, comparable to healing or development of immunological resistance, to protect the existing functions and not to create new functions. Rather than starting our discussion with the postulated “common ancestor”, I shall start with what we all observe – a variable population. When we look around ourselves in this auditorium, at the pigeons on a roof or at the spruce trees in the nearby forest, we see variability. Variability is a biological fact. I shall talk about the source of this variability a little later but now I wish to consider how races develop out of the existing variability. It is completely immaterial what organism we are talking about – the processes are the same. Let us consider a hypothetical population as in Fig. 1, variable at the level of gene A. The symbols used here represent the variability of this population. The couplets are representing diploid genomes. The subscript numbers may be considered as 10 different alleles, A0 indicating a lethal allele, so that the A0A0 variant does not exist in the population - it dies before reaching reproductive age. The other couplets are either homozygous (same allele inherited from each parent) or heterozygous (different alleles inherited from the parents). The number of A0 alleles, all in heterozygous couplets, represents the genetic load – number of lethal genes present in the population. Fig. 1 A variable population of a species. Now let us imagine that for some reason fragments of this population get isolated. Fig. 2 Isolation of population of fragments. The isolated populations differ. Being isolated means also that the population is small, in some generations bigger, in others smaller, but much smaller than the initial population from which it separated out. The variability of each is smaller than that of the original population and they differ from each other in the composition of variants. In the example shown in Fig. 2 each of these fragments has only five alleles A1,A2,A3,A8,A9 and A2,A3,A4, A5,A7 and they have only two alleles in common A2 and A3. At the time when the population is smallest the reduction of variation will be greatest. Due to this reduction in size again some variants may be lost leading to further impoverishment of the isolated population. Fig. 3 Reduction in size leads to loss of variability. A small isolated population always experiences some degree of inbreeding. There is an increased sexual contact between relatives. This leads to homozygosis, a further reduction of genetic variability. After a few generations some variants (alleles) will be lost. This is referred to as genetic drift. It can be compared to the reduction in the number of surnames among isolated small human populations – often experienced among insular populations e.g. in the Caribbean. Fig. 4 Effect of inbreeding. It is processes such as these that have led to the differences between finches observed by Darwin on various islands. Exceptional windstorms can bring birds long distances well beyond their normal flying areas. If such birds end up isolated on different islands they will develop populations that will differ from one island to the other. 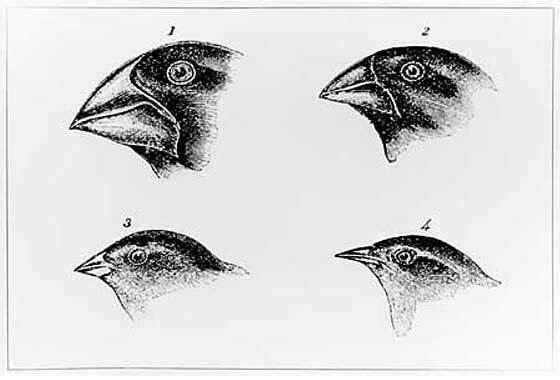 Darwin observed these differences, particularly in the shape of the beaks, and realised that isolation on separate islands is responsible for the maintenance of these differences. Fig. 6 Effect of natural selection. If in the various environments different forms are unable to survive we shall get a further reduction of variation in each population and a growing differentiation between them. Selection against a single diploid variant in each of the populations has led to a situation where, as we can see, by now there are very few common variants between the two hypothetical populations. The peppered moth Biston betularia L. is often used in school textbooks as an example of natural selection. The moth lives on the bark of birch which is normally greyish white. Moths that are too dark are spotted by birds and consumed, thus there is a natural selection against dark forms. Lighter ones predominate. However in industrial regions, where the bark of birches was covered with soot, the dark forms became more common, since they were better protected from birds in this environment. When the industry became more environment-conscious and clean, the bark of birches again became white and the whitish forms of the moth again became dominant. Obviously natural selection determines which variants predominate in a given environment. Fig. 7 The peppered moth variants. The moths were never truly isolated so as soon as the environment changed so did the population of the moths. The termination of isolation between an outlier population and the main range of the species results in the specificity of the isolated population disappearing. It must be stressed that the formation of races is not an example of a small step in evolution and anyone who claims that is misleading. Also coalescence of several outlier populations, when for some reasons the cause of isolation disappears, leads to a situation where the original population is more or less reconstituted. Fig. 8 Reconstitution of population variability following termination of isolation. This growth of variability due to mixing of isolated populations is also quoted sometimes as an example of evolution in progress. All of the above is common knowledge to population geneticists. It is obvious that natural race formation is a consequence of the reduction of genetic information and therefore a process in the opposite direction to evolution. The growth in variation due to mixing of races also bases on the existing variability and is not a process creating new genetic information. Fig. 9 Effect of artificial selection. What they are like will depend on what we select for. As we all know the selected races are genetically impoverished. Usually unable to exist without the help of man. They will remain “pure” as long as we keep them isolated. As soon as we forget about the isolation we end up with mongrels. Another paper presented at the above mentioned sitting of the Pontifical Academy of Sciences in the Vatican by Prof. Ingo Potrykus6 entitled “Plant breeding as an example of directed evolution” showed already in the title that experience from breeding is claimed to be evidence for evolution. However even the author himself said that breeders use only the information that is available to them as produced in the course of evolution. They create nothing new, only reshuffle existing genes. Breeding work has taught us several important things. First of all we now know that there is a limit to the possibility of breeding in any particular direction. The information content of a gene pool is finite. In breeding we can use what is available and no more. Secondly we know that our improved varieties need isolation to maintain their improvement. Without the isolation they will go wild, interbreed with the wild varieties and thereby lose their identity. Thirdly we know that highly bred, improved varieties are biologically weaker than the wild varieties. We have painfully learned that wild varieties are absolutely necessary for breeding work. We must have the rich pool of genes in the wild conditions to be able to select from and to incorporate what we need into our bred varieties, as new demands on the breeding program are articulated. To summarise, we must learn how to manage the resources of genetic information available to us in nature, because they are finite and can be irretrievably lost. Fate of Information in Living Systems. Now let us consider what happens to genetic information in the natural conditions and in view of breeding work. This is summarised in Table 1. 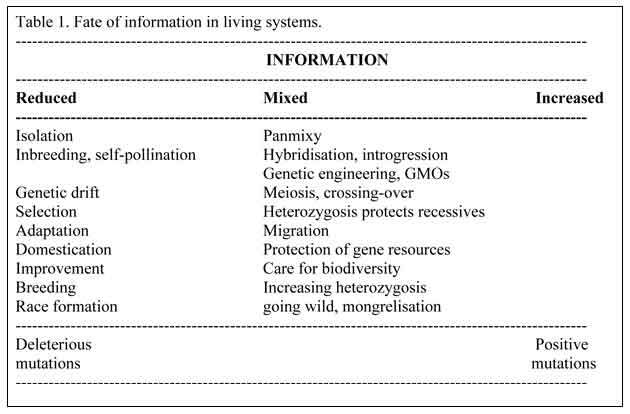 Table 1 Fate of information in living systems. We have already seen how reduction of genetic information results as a consequence of isolation, selection and breeding. Yet we keep on seeing in nature a large variability. Where does it come from? The answer is that it comes from the mixing of existing variability. Table 1 lists the mechanisms involved. It appears that the main role of sexual reproduction is to generate variability. Both the choice of sexual partners, often accidental, determined by wind or insects carrying pollen, and the meiotic division of a diploid nucleus, including an exchange of parts of the genetic material inherited from the two parents (crossing-over), lead to an enormous diversity in nature. Let start our considerations from only two individuals heterozygous for three genes only. Jointly they have four alleles of each of the considered genes (A, B and C). Fig. 10 Development of genetic diversity from two heterozygous individuals only. In the first generation each of the 8 gametes (2x2x2) from one parent can meet with any of the 8 gametes from the other parent yielding 64 possible variants. If the parents are self fertile (as some plants are) already in the first generation each of the 16 possible gametes can meet with any other yielding 136 possible variants (of the 256 combinations 16 will be homozygotes and among the remaining 240, due to reciprocity, there would be a repetition of each combination, so that in fact only half i.e. 120 would be different). In further generations gametes with all possible combinations of four alleles of A, B and C will be able to appear, that is there would be (4x4x4) = 64 variants of gametes. These can meet with each other yielding 2080 diploid variants. The above calculation considers only three genes and only 4 alleles in each of them. In fact with thousands of genes the possible variation developing from a single pair of heterozygous individuals is virtually infinite. No wonder we find such great variation in nature. Nature has no problem in developing diversity. Sexual reproduction, the random probability of a variant meeting any other one (panmixy), occasional transfer of genes between species (introgression) through hybridisation or through genetic engineering (natural or man made – GMOs), the meeting of distant populations due to expansion of ranges or transfer of biological material by humans – all maintain great biological diversity in nature. We have much to choose from. We do not need mutations to explain variation in nature, however, let us consider them also. We know that mutations occur and generally we fear them, because as a rule they are deleterious. We try to reduce exposition to X-rays, radioactivity and mutagenic agents such as asbestos etc. We fear nuclear wars, accidents in nuclear power plants, cosmic radiation through the ozone hole etc. In terms of genetics, mutations are changes in the genetic code defining individual genes (in the DNA). Returning to our example of a population as in Figure 1, we can imagine that occasionally one of the alleles A1 to A9 mutates, becoming dysfunctional, and therefore equivalent to A0. Should in the progeny an A0A0 individual occur it will perish before reproduction or for some reason will be selected against because of its dysfunctionality. For the individual this is a personal problem. For the population, increase in the number of defective genes (genetic load) is of significance, because it leads to an increase in the number of defective individuals being born. In fact we do experience an increase in the number of lethal genes in populations of all species, the human population included, due to persistent action of mutagenic agents. Obviously mutations that damage functional genes are of no use to evolution. Some mutations are neutral. This means that a change is introduced which has no effect on the functionality of the organism. We know that such mutations exist and their influence on the population as a whole is nil. A classical example of such a mutation would be a change in a DNA codon that does not change the amino acid it codes for. For example the amino acid glycine is coded by codons GGT, GGA, GGC and GGG, thus a mutation that changes the third nucleotide in any way sill maintains a codon requiring glycine in the specific place in the protein. Such changes are also useless for evolution. Only positive mutations can profitably increase genetic information, provided they lead to new functions or organs. However positive mutations are still only a postulate. No examples that could be quoted in textbooks are known to science. The claim that genetic adaptations to man-made chemicals (antibiotics, pesticides, fungicides, herbicides) represent evidence for positive mutations is unacceptable. Let us analyse one specific example. Amaranthus hybridus L. (smooth pigweed) is a weed that has adapted itself to the herbicide Atrazine.7 Atrazine was developed specifically to combat this weed. It acts by attaching itself to a protein (QB) coded by gene psbA important in the photosynthetic process. The protein-Atrazine complex prevents photosynthesis in the smooth pigweed. In the resistant variety the sector of the protein to which Atrazine attaches itself has a change of one amino acid, from serine to glycine. This prevents Atrazine from attaching itself to the protein and results in Atrazine-resistance. In the genome serine is coded by the AGT triplet (adenine, guanine, thymine) while glycine is coded by GGT (guanine, guanine, thymine). This change occurred in the psbA gene in the 682 position. Thus effectively a mutation of one nucleotide from adenine to guanine (AGT to GGT) has provided the smooth pigweed with resistance to Atrazine. This is advertised as a positive mutation that gave Amaranthus hybridus a new function, resistance to an herbicide. However, it needs to be pointed out that the mutated form lowers functionality of the QB protein. Thus, as soon as use of Atrazine is discontinued the wild form of pigweed returns. Thus, by natural selection, the wild form is preferred and not the resistant one. In experimental conditions, using cell cultures of Nicotiana tabacum cv. Samsun treated with Atrazine, a change was obtained in the 264th codon of its chloroplast psbA gene from serine (AGT) to threonine (ACT). This single nucleotide change (from guanine to cytosine) also provided Atrazine resistance which was stable in the absence of continued selection pressure.8 A similar serine to threonine substitution giving Atrazine resistance was observed in potato cells.9 This was not tested in field conditions. Now what are the conclusions? To start with, the mutated protein performs the same function in photosynthesis as before. Thus for the organism in question (smooth pigweed, tobacco, potato) the mutation was a neutral one in the case of the serine to threonine change, or slightly deleterious in the case of the serine to glycine change. The acquired resistance amounts to protection of an existing vital function that has been inhibited by an artificial chemical introduced into the environment. It is not a new function, but a defence of an old one. This is comparable to the acquisition of resistance to various diseases following vaccinations. In nature duplication of gene sequences is possible. One could argue that the pigweed could achieve a duplication of the mutated genome sequence, so as to hold both the wild type (for normal conditions) and the mutated one for times when Atrazine is released into the environment. Furthermore one could argue that development of new herbicides might lead to other mutations similarly neutralising their effects. Following duplications the pigweed could hold in store many variants of protein QB or other targeted proteins able to deal with the potential presence of a whole list of herbicides in the environment. However, this would be again no more than a defence of existing functions, like the vaccinations we get for many different diseases. Thus it is improper to use the information about resistance of Amaranthus hybridus to Atrazine achieved by a mutation as evidence for a positive mutation or as evidence for a small step in evolution. Throughout Europe evolution is taught in schools as a biological fact. The main evidence for this presented in school textbooks is based on the assertion that formation of races is an example of a small step in evolution. This is profoundly wrong. Races form as a consequence of genetic drift, selection and isolation. Genetic drift results from the accidental loss of some genetic variation in small populations due to inbreeding. Selection depends on the elimination from a population of all forms not adapted to the particular environment. With this elimination also some gene variants (alleles) get lost. For natural races to be identifiable they have to remain isolated from the main body of the population. The same is true in breeding, where the breeder reproduces the race formation procedure only applying selection pressures of his own choice and selecting for rather than against specific features. Macroevolution requires increase of genetic variants, thus race formation which depends on their reduction is a process in the opposite direction, comparable to extinctions. Positive mutations, as a mechanism leading to new functions or organs, are an undemonstrated postulate. We can demonstrate many neutral and negative mutations, but no positive ones. The claim that the appearance of resistance to man-made chemicals (herbicides, fungicides, antibiotics etc) is evidence of positive mutations is questioned on the ground that it belongs to the multitude of defence mechanisms (like healing or acquiring immunity) defending existing life functions of an organism and not creating new ones. 1 Prof. emeritus of the Polish Academy of Sciences Institute of Dendrology, 62-035 Kórnik, Poland. Main speciality: population genetics of forest trees. 3 Wilkins D.A. 1957 A technique for the measurement of lead tolerance in plants Nature 180; 37-38. 4 Wilkins D.A. 1960 The measurement and genetical analysis of lead tolerance in Festuca ovina Scottish Plant Breeding Station Report; 85-98. 7 Hirschberg J, Mcintosh L. 1983 Molecular basis of herbicide resistance in Amaranthus hybridus. Science 222; 1346-1349. 8 Sato F., Shigematsu Y., Hamada Y. 1988 Selection of an atrazine-resistant tobacco cell line having a mutant psbA gene. Molecular and General Genetics; 214; 358-360. 9 Smeda R.J.., Hasegawa P.H., Goldsbrough P.B., Singh N.K., Weller S.C. 1993 A serine-to-threonine substitution in the triazine herbicide-binding protein in potato cells results in Atrazine resistance without impairing productivity. Plant Physiology. 103: 911-917.